A number of tours will be offered to the conference participants and accompanying persons (at an additional cost), giving the opportunity to visit some of the most interesting places on Crete or near Crete. In the meantime you can start exploring Crete from your computer! Minimum of 20 persons per tour are required for the tour to take place. 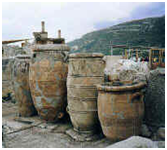 This is the tour that reveals the secrets and life of the Minoans. A flash – back to Crete’s ancient history and Minoan Civilization as well as the spiritual strength which made Crete famous all over the world. Visit Europe’s first Palace and enter the spirit of the myths. Walking round the narrow corridors of the labyrinth construction you’ll have the opportunity to see all the samples and symbols of the progress and culture developed in Crete 4000 years ago as well as feel the mystical evidence of the Minoan grandeur. The myths come alive again after visiting the Palace of King Minos at Knossos. After Knossos Palace, we will take a guided tour of the beautiful city of Heraklion which is the capital of Crete. You may see many places of interest which will include the recently restored Venetian castle and some other nice Venetian remnants – the Famous Morosine Fountain and the pretty restored Loggia, along with many shops and sidewalk cafes. Don’t miss the archeological museum of Heraklion which hosts the most important findings of Minoan civilization such a Disk of Phestos. A flash – back to Crete’s ancient history and Minoan Civilization as well as the spiritual strength which made Crete famous all over the world. Visit Europe’s first Palace and enter the spirit of the myths. Walking round the narrow corridors of the labyrinth construction you’ll have the opportunity to see all the samples and symbols of the progress and culture developed in Crete 4000 years ago as well as feel the mystical evidence of the Minoan grandeur. The myths come alive again after visiting the Palace of King Minos at Knossos. After Knossos Palace, explore the Mediterranean sea world in Cretaquarium. Come face to face with hundreds of species and thousands of living organisms. Be fascinated by their behavior as they reveal the wide variety of shapes, colors, habits and needs of their own world. Learn about them and reflect on what our common future may be. 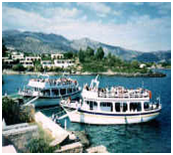 A mini-cruise inside the calm waters of the Mirabello Gulf, to the island of Spinalonga is one of the most popular trips. The remains of its Venetian fortification and ghostly leper barracks almost untouched through the centuries, lies silently opposite Elounda’s coast. 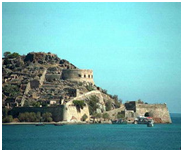 Spinalonga’s Venetian castle is one of the main castles in Crete which was never conquered during the Turkish occupation. A guided tour will conduct you to the sorrowful destiny of the islet. The boat sails after to Kolokytha Bay for swimming in the crystal waters and a barbeque lunch. In the early afternoon, you move on to the picturesque town of Agios Nikolaos, where you can enjoy your coffee in one of the many street cafes along the pretty lake in the town center before your return to your hotel. Should take: Bathing suit, Sun protection, Camera. A spectacular trip for those who love walking and have the spirit for adventure. Visit Europe’s longest and most beautiful gorge (18 km long). After an impressive drive along the North coast of Chania through the White Mountains up to Omalos Plateau, you finally face the challenge: a guided walk through the extreme beauty and diverse landscape! In this national forest you discover the Cretan fauna and flora! This hiking adventure ends at the Libyan Sea, in Ag.Roumeli: an un-spoilt fishing settlement, where you can have a refreshing swim and time for lunch before the ferry takes you along the coast to Chora Sfakion or Sougia. Return to resort by coach. A full day excursion, offering a unique exchange and contrast of landscapes, between the north and south coast, mountains and sea. It is an absolute Must when in Crete!!!!!! Should take: Comfortable walking shoes, sun protection (hat, sun cream), bathing suit, towel, bottle of water (you can refill in the gorge), and snacks. This one day trip takes us to the Arkadi Monastery, located on a high plateau with a nice view of the sea below. One of the most tragic and heroic chapters in the history of the island was written here: the resistance against the Turkish occupation came to its peak in 1866 when approximately 1.000 Cretan took refuge here and instead of surrendering they dared a mass suicide by blowing-up the powder magazine . Travelling along the north west coast we reach Chania , the former capital and the most attractive town of Crete : take a relaxing walk through the charming narrow streets in the old part of the city with the “oriental” market .Here you can find a big variety of leather goods and Cretan folk art items. On the way back we stop in Rethymno. Visit the Venetian part of the city with the curling narrow streets, the Turkish minarets and fountains and feel the local turbulent history. A fabulous one day cruise to the legendary “Atlantis”. Santorini is a magical island, considered to be one of the most picturesque of whole Mediterranean, offering incomparable beauty with volcanic terrain. Enjoy the unique view to the endless blue of the Aegean Sea, offered from whitewashed villages, hanging on the lava rocks and discover the archeological sites of the island, buried under lava, the Aegean Pompeii. Enjoy a long day and offer yourself a unique chance to explore another Greek island! Should take: Comfortable shoes, camera, sun cream.